'Their goalscoring is frightening' – Can Dortmund end Bayern's reign? Borussia Dortmund are one of Europe's top sides after an electrifying start to the season - unbeaten in 12 games in all competitions. But can they end Bayern Munich's six-year hold on the Bundesliga title? Lucien Favre's side sit top of the table after eight games going into Saturday's home match against Hertha Berlin, with Bayern four points down in fourth place. They also top their Champions League group, with three wins from three after thrashing Atletico Madrid, and their usually rock-solid backline, 4-0 on Wednesday - Diego Simeone's biggest defeat in seven years in charge of the club. 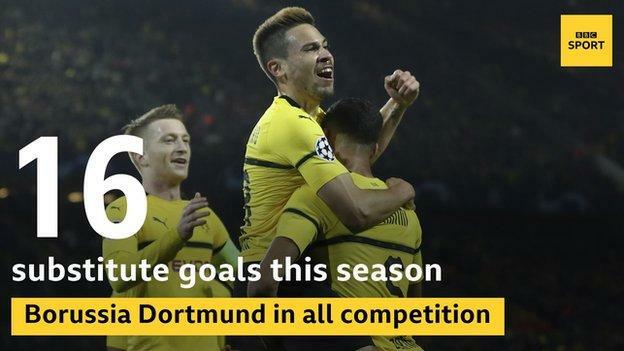 Dortmund, who last won the league in 2012, have scored 37 goals in 12 games since Favre took charge this summer - despite creating fewer chances and taking fewer shots than previous seasons. In the Bundesliga, they are scoring a goal for every 3.85 shots they take - so is this finally their season? 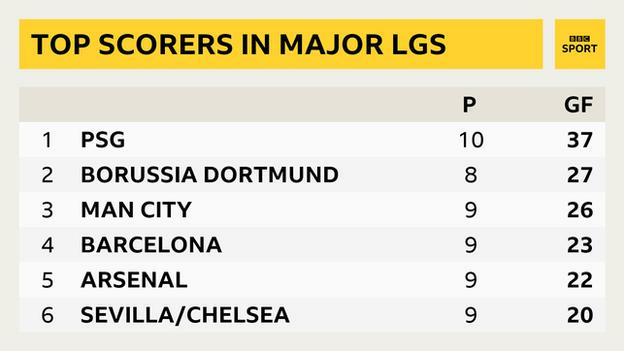 German football journalist Raphael Honigstein said on the BBC Euro Leagues Football Show: "Their run of results and goalscoring is frightening. Bayern are showing a bit of weakness. Those things have to come together for a challenge. "Lucien Favre has an unbelievable ability to improve teams - even statistically. These teams always outperform both defensively and in attack, stats-wise. You think they shouldn't be scoring as many and should be conceding more. "If it's a one-off, you think it must be luck. But he does it at every single club he comes to. "It's an unbelievable combination in terms of excitement, energy and dynamic - and a nice balance in Axel Witsel and Thomas Delaney, who are holding midfielders with real authority and do the dirty stuff. It's a great team who are fun to watch." So many of Dortmund's goals are coming from the bench this season - 16 in total, including three of their four strikes against Atletico. Their 10 Bundesliga goals from substitutes compares to two, one, four and zero at this stage of the previous four seasons. "The substitutes have a real impact immediately," said Honigstein. "Favre takes out a little book and starts drawing and shows them where he's seen a weakness in the opposition back four, where they should run, how they should run, who they should attack and what spaces they should run into. And it works. "He's got a rare ability to really understand football at a level most coaches and pundits don't. I don't think we can see what he sees." Paco Alcacer, on loan from Barcelona, is Dortmund's top scorer - despite only playing 216 minutes for the club so far. He has scored eight goals in five appearances - one every 27 minutes. He managed six goals in his first three Bundesliga substitute appearances and has also netted on both his starts. Marco Reus, who has started every game, has already matched his goal tally of last season's injury-hit campaign - with seven goals in 12 games. Youngsters Jacob Bruun Larsen and Jadon Sancho - neither of whom were regulars last season - have both scored three times so far. New England international Sancho has also set up eight goals. With plenty of his appearances also coming from the bench, he has had a hand in a goal every 46 minutes. Dortmund are on their fourth manager since Jurgen Klopp left in 2015. Thomas Tuchel - now Paris St-Germain boss - had two years in charge but his replacement Peter Bosz, recruited from Ajax, was sacked after only seven months. Peter Stoger replaced him, a week after being sacked by struggling Cologne, in December on a deal until the end of the season. Favre arrived this summer after two impressive seasons with Nice, finishing third and eighth in Ligue 1. The Swiss - who has yet to win a major trophy outside his homeland - had previously managed Hertha Berlin and Borussia Monchengladbach in the Bundesliga. "We've had two managers before Favre who said 'we have all these amazing players, just do your stuff, take up different positions'. And Dortmund had no structure," said Honigstein. "People didn't know what they were doing. "Everyone was taking a lot of risks - and as a whole Dortmund were a disaster. Favre has real processes, patterns, ideas - you go one way and the other guy has to go a specific way as well. "They suffered before Paco Alcacer came in because he was the focal point those guys needed. It was very difficult to do that game effectively - taking up the positions in the right spaces and those reference points. They managed to do that against Atletico without him and it was a huge test of their maturity. "Nobody really thought it was possible when the line-up was distributed in the stadium with Mario Gotze and Marco Reus basically named as the centre forwards. People were very disappointed and felt they wouldn't win the game as Alcacer was doing that job. But Dortmund stepped up and were magnificent." One disclaimer to all of this though - last season they were only one point worse off, and one off this season's goal difference, after eight games under a new manager. Bosz was sacked two months later after eight games without a win - and they only crept into the top four on goal difference. Related Blogs on 'Their goalscoring is frightening' – Can Dortmund end Bayern's reign?